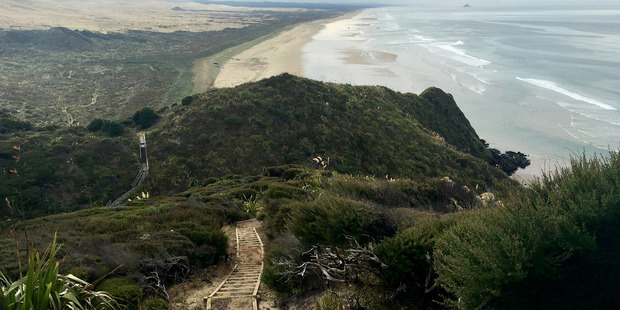 The staircase leading down to Scott Point and Ninety Mile Beach, at the start of the Te Araroa Trail. More than 500 people have walked the Te Araroa Trail from Cape Reinga to Bluff in the past year, with 20 per cent of them New Zealanders. The Te Araroa Trail is proving popular for visitors and Kiwis alike - 550 people have walked it from Cape Reinga to Bluff in the past year, with one in five hailing from these shores. It's a big increase on the 350 people who walked the whole trail in 2015-2016 and the 210 who enjoyed it the year before. Te Araroa Trust chairman David McGregor said hundreds of Kiwis walk the trail in sections over a number of years and many thousands more were enjoying individual sections as day walks. "Awareness of the Te Araroa experience is growing and people at many different stages of their lives are now walking it, from students and young people taking a gap year to retirees and workers taking an extended holiday," he said. "It's a great way to connect with New Zealand and to really get to know the landscapes, people and climate that have shaped us as a nation." New Zealanders Michelle Campbell and partner Jack Faulkner said it was a brilliant way to see the country and completing it last year was immensely satisfying. "I had been thinking about long distance walking for years and had been considering the Appalachian Trail in the United States until I heard about Te Araroa," Ms Campbell said. "I quit my job, Jack finished a contract and we threw our worldly possessions in a storage unit and hit the trail." ■ Te Araroa is New Zealand's longest Trail at 3000km, stretching from Cape Reinga to Bluff. It was officially opened December 3, 2011 by then Governor-General Sir Jerry Mateparae.